Lady, April 3rd 2008, crossed the Rainbow Bridge unexpectedly. A special, loving, curious gal who is sadly missed by all who knew her. It’s been very hard to write this memorial, as I always want my animals to have free range, to explore, investigate, and socialize with each other. Lady, died an unexpected, a tragic death, due to nature’s way of mating. I never knew that could happen. Animals mate in the wild, and with nature all the time. My vet, said, “oh she won’t die. That happens in the wild all the time.” Being very in tune with my animals, Lady, told me, she was not going to make it through this.This time, Lady would not survive and did die the next day. I acquired Lady, and her friend Jenny, in October of 2005, from Lisa, from H.E.A.R.T Humane Enforcement and Animal Rescue Team, from the N.Y. area. Lady was a young turkey, just a few months old, born with beautiful white shinning feathers, and unfortunately, from an online breeder. She had very crooked feet. Lady was a production turkey, bred by a person who wanted to make money raising turkeys. instead, he had to get rid of them. “No money,” he said. That did not stop Lady, from getting around and walking up and down the pasture at The Gress Mountain Ranch. 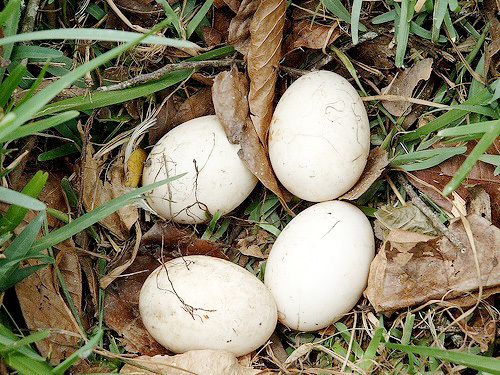 Lady did lay 75 eggs one season, no live births and many people cherish her eggs now! Lady was very sweet and would look at you and have a gentle gaze. Lady, was the first turkey, to allow human contact and the human touch in the act of petting and stroking her back, neck and top of her head. Lady helped many people, to desensitize and decrease their fears or phobias about birds. Lady, helped to educate children, in the schools that were learning about turkeys as they were in nature…not about Thanksgiving. You, know, as I stated, I helped all the turkey/duck group, to have “free range, walk around, mingle with each other, under supervision. There would be some knock down, drag down fights, with these birds. In the beginning, they just “did not get along as their former owners had stated. I engaged as a referee a few times for these birds. In the wild, the turkeys have a mating season and Clarence, the male Tom turkey came into season early this year….and that’s when the tragic death of Lady occurred. Lady has come into our lives, and went out quickly. She left her sweet love and gentle-eyed gaze on my heart forever, and I will never be the same. Thank you, Lady, for all the healing you did give to us humans to decrease our anxious feelings, about birds. Lady, thank you for extending yourself and helping so many people. May you live free and without pain, till we meet again. K.G.